Yesterday we went for a drive over to Hyams Beach on Jervis Bay. The Guinness Book of Records reports Hyams Beach as having the whitest sand in the world. Unfortunately, the day was overcast and, after spending time at Swimcart Beach on Tasmania’s north east, we couldn’t see it. We did see these striking orange flowers though. I’m not sure what they are – a variety of ginger perhaps – and there was a large group of them, standing tall, and watching over the beach goers. The group of flowers and a hint of white sand in the bottom left hand corner. We’ll have to return on a sunny day so I can share photos of the whitest sand in the world. 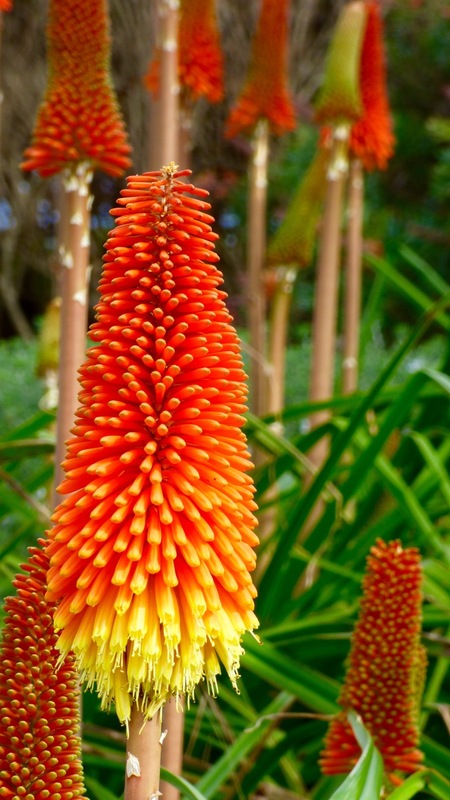 Update, Monday afternoon – Thank you to Cathy @ Still Waters who happily informed me the flower is a Red Hot Poker Torch Lily. It is not native to Australia, but can be found in the central and southern tablelands of New South Wales as well as southern Victoria, where it is now regarded as an environmental weed. As sad as that is, I was attracted to it’s brilliant colour. Love the colors on those weeds! Have you had a chance to get back to see the super white sand?? But perhaps this week – providing the sun is willing to shine. 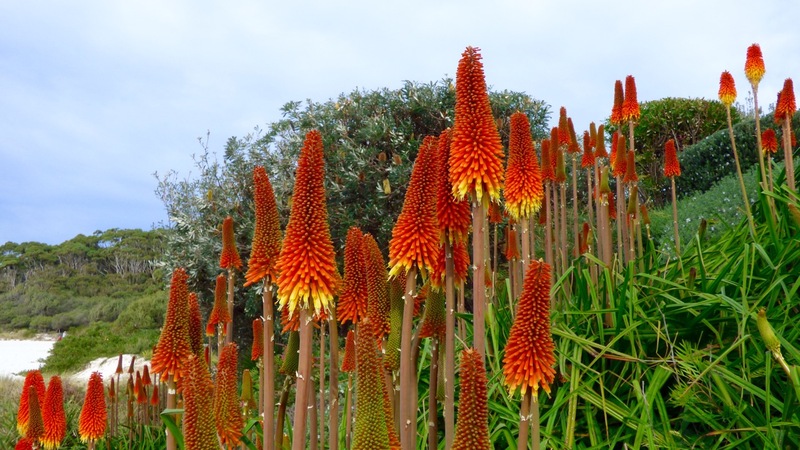 I love Red Hot Pokers because they’re so bright, but also because the flower when in winter, when most of the garden is a little dull. If only they weren’t classified as weeds here in Australia. I didn’t know that. Aaagh! Love your photo of such beautiful flowers. Hard to believe that they are weeds. . Have missed a few of your photos as I’ve been doing an assignment. We leave for Malawi and Kenya on Thursday so will miss all your beautiful stories and photos All the best in your travels. Yes it is sad that they are weeds as the flower is quite striking. Safe travels and I look forward to hearing all about your trip when you return. Thank you for joining in and I love your photo of ‘The diversity of Bangkok’. You are most welcome Gill, and thank you for joining in and sharing your photo. Beautiful flowers! Weeds??? Who’s to say! I am participating in Photo of the Week. Please come over and see! Sad but true and I absolutely love your photo. Thank you for sharing. Great photos. Really beautiful flowers. I need visit your part of the world to compare. We have extremely white sugar sand here too. Our county even has a building ordinance for putting fill on the beach. It has to be tested for color so that new fill does not discolor our natural white sand. At night the dunes look Ike snow drifts. From what I can see in the corner of your photos, Guinness is right, the sand there is extremely white. I do hope we have a couple of sunny days to get some memorable photos of the white sand. I still think the sand in Tasmania was whiter and agree with the snow drift impersonations – we saw a few. Thank you for that, I did search, but couldn’t find anything. We’re here until mid September. It will be good to be out of th ecold, but I’ve no doubt our feet will be very itchy by then. Oh! Those flowers are so beautiful. Kim has told me how white the sand is over in Perth as well. I’ll have to see for myself when we get to Western Australia at the end of the year.